Blending calculations for liquors containing sugar are complicated by the fact that while the strength of a liquor containing only alcohol and water can easily be determined from its density or SG, the addition of sugar "obscures" the alcohol content and the alcoholometric tables issued by the excise authorities can not be used. This obscuration is because alcohol is less dense than water but sugar is more dense than water. Adding sugar increases the density of the liquor and therefore masks or obscures the alcohol content. In the USA the TTB allows distillers to use their "proofing by obscuration" method for liquors containing less than 600 mg of dissolved solids per 100 ml of spirit. This limit is only 6 gram per liter and most liqueurs are well above this and cannot use the proofing by obscuration method. The legally accepted method for alcohol measurement in liquors containing more than 6 g/L of sugar is to perform a lab distillation. This is a time consuming process and doing it repeatedly as required in the traditionally used trial-and-error blending procedure is a frustrating waste of time. AlcoDens LQ can cut through this trial-and-error procedure with its accurate calculations and the lab distillation is only required once or twice. The liqueur blending calculator has two modes of operation. It can either be used to calculate the ingredients to blend a specified quantity of product, or it can be used to calculate what additional ingredients must be added to a specified quantity of base liqueur to correct the alcohol and sugar levels. Examples of both of these blending calculations are given below. The calculator is also useful for blending non-alcoholic syrups. Examples of syrup blending calculations are included in the Help system included with the downloaded program. Although the blending calculator is not difficult to use, in order to provide the necessary flexibility it does have a lot of settings and inputs. 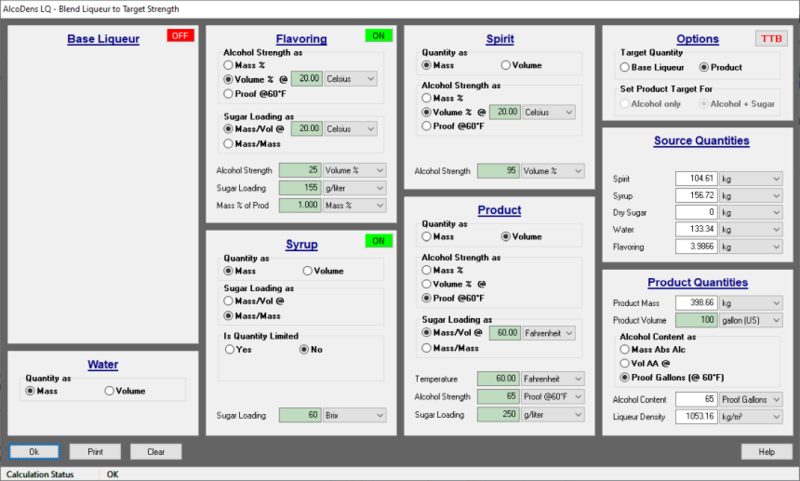 This makes the liqueur blending calculator look rather complex at first sight, but you will soon see that many of the settings are the same for several of the raw materials and as soon as you have mastered one of the sub-panels you will also understand the others. 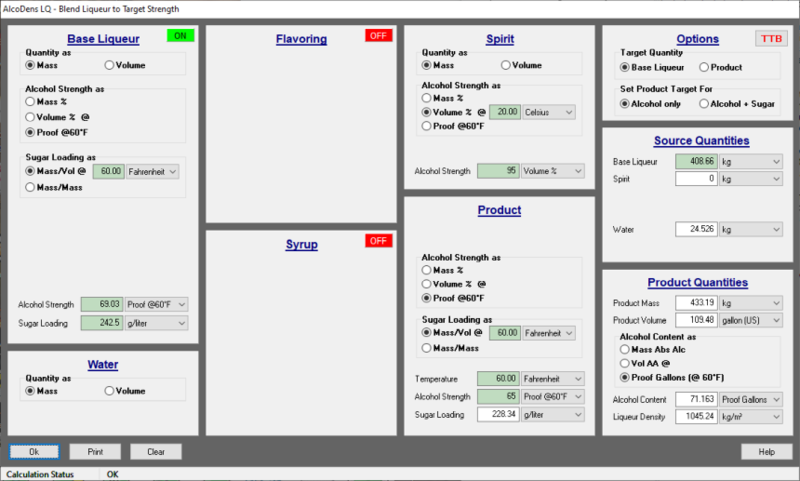 When applicable, an entire panel can be switched off to simplify the look of the liqueur blending calculator. And the input fields for any data that is not required for a specific blending calculation will be hidden. As an example, we will calculate what raw materials are necessary to blend 100 US gallons of liqueur at 65 proof and 250 g/liter of sugar (measured at 60°F). There is no base liqueur available and the base liqueur panel is switched off (see image below). There is syrup available at 60 Bx and spirit at 95 ABV (measured at 20°C). A flavoring agent will be added at 1% of the total product mass. The flavor contains 25% ABV and a sugar loading of 155 g/liter (both measured at 20°C). All raw materials will be added by mass. Both of these rules can be modified slightly by the user by either turning off the availability of base liqueur or syrup completely or by setting limits on the amount of these available. The liqueur blending calculation as performed by AlcoDens LQ is shown below. Note that although the target quantity of product was set in volumetric terms (100 gallons) the user is able to choose whether to measure most of the raw materials for blending by mass or volume - only the flavoring and any dry sugar required must be measured by mass. Having made up the liqueur using these quantities, having mixed it thoroughly and left it to settle overnight we take a sample and confidently take it to the lab for analysis. Much to our surprise the lab reports that the proof is 69.03 and the sugar loading is 242.5 g/liter (against the target values of 65 and 250 respectively). A bit of checking shows us that the total mass is 408.675 kg instead of the expected 398.675 kg and we start to suspect the problem with our blend is in the raw material quantities. A close examination of the log sheet shows that Igor added 114.61 kg of spirit instead of 104.61 kg. So the proof is too high and the sugar loading is too low. What must we add to get to the target values, with the minumum of extra raw materials? This is exactly the liqueur blending problem AlcoDens LQ is designed to solve. 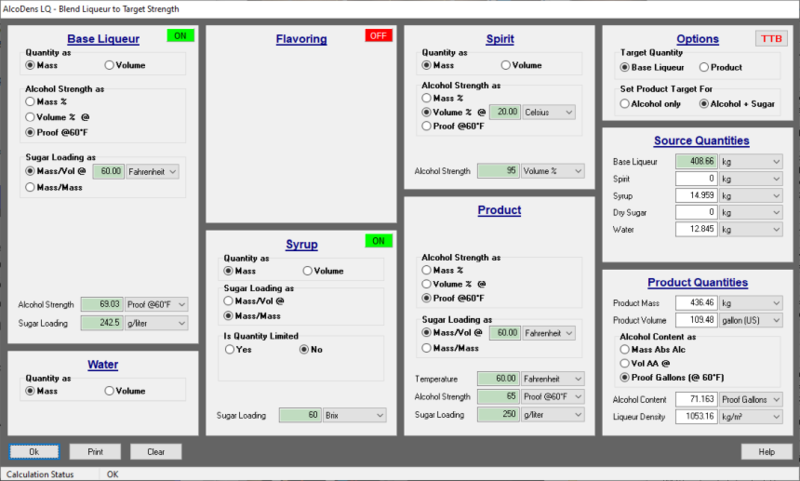 We change the target quantity option in the top right panel from product to base liqueur and this automatically turns the base liqueur panel back on. We key in the proof and sugar loading given by the lab for the base liqueur and turn off the flavoring panel because we need to add additional flavoring only in proportion to the extra ingredients that will be added. If necessary, once we have calculated the new total product mass we can come back and calculate a bit more flavoring. The specifications for the syrup, spirit and product remain exactly as before and the additional quantities of syrup and water required are calculated and shown in the source quantities panel. The product quantities panel shows that we will get approximately 10% more product than we were originally targeting. This is not surprising since Igor added roughly 10% more spirit than he should have. The final blending calculation is shown below. AlcoDens LQ has calculated the minimum quantities of additional ingredients required to correct the proof and sugar loading to the original target. This minimization is ensured through the application of Rule 1 given above. It can happen that after the initial blend is prepared the alcohol and sugar levels are very close to their targets and the distiller decides that the sugar loading is "close enough" but a final tweak is required to the alcohol to meet excise requirements. For this situation AlcoDens LQ includes the capability to adjust only the alcohol concentration to the target while allowing the sugar to find its own level. In this case only spirit or water will be added and no further syrup or granular sugar is allowed. In the example above we corrected the base liqueur to the orignal targets of 65 Proof and 250 g/liter sugar, but now we will recalculate it so that the Proof can be adjusted from 69.03 to 65.00 while ignoring the sugar level. An interesting point to note in comparing the options with and without additional sugar is that in both cases the volume of liqueur finishes up exactly the same (109.485 US gallons). This is because the Proof needed to be adjusted downwards, so no additional alcohol would be added. All the alcohol was already in the base liqueur and since the Proof is set at 65.0 in both cases having a fixed quantity of alcohol resulted in a fixed volume. In the Options panel in the top right corner the Product Target has been set to "Alcohol only". The means that the Product Sugar Loading will find its own level. In this case the sugar loading has turned out to be 228.343 g/liter. This will give the distiller an indication of whether the taste will vary enough to justify adjusting the sugar as well. Click on the image above to watch a YouTube video tutorial on how to use the liqueur blending calculator.